One of of the best Grout Sealers available is Tileguard Tile and Grout Sealer. It provides a clear penetrating solution that waterproofs grout and tiles without a slippery ﬁlm coating. Specially formulated to maximise water resistance, Tileguard Tile and Grout Sealer reduces the growth of mould and mildew without leaving a slippery surface. This Grout Sealer is a transparent, penetrating solution, for use in all wet areas of your home. Ideal for the shower, bathroom, kitchen and laundry, prolonging the life of un-glazed tiles and grout. 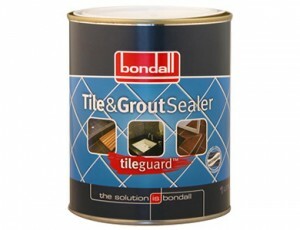 Find out more about Tileguard Tile and Grout Sealer here. Posted in Bathroom tile sealer, Floor tile sealer, Grout Sealers, Sealing Tiles, Tile sealer, Tile Sealers.